In DTI 101 we described how diffusion tensor imaging estimates brain microstructure by modeling diffusion of water in the brain. 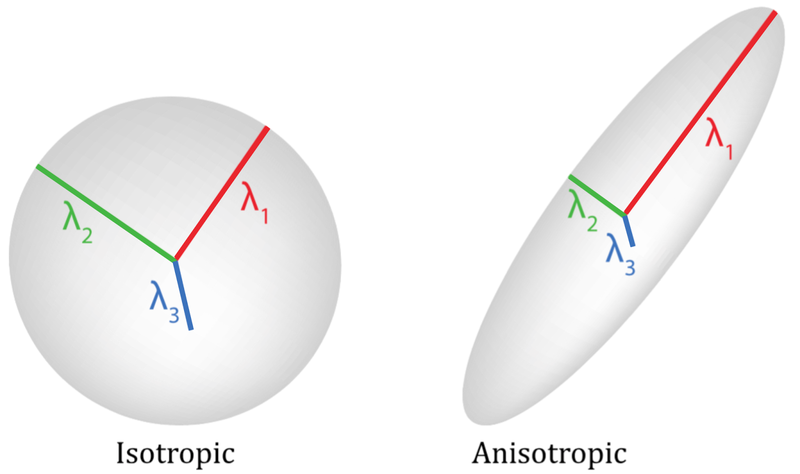 We briefly discuss that this is done by using ellipsoid or ball shaped tensors. This leads to the question; what is a tensor? In the scanner the diffusion tensor is measured by imaging the diffusion in individual gradient directions, like in the image below. If you are interested a more in depth mathematical explanation of this principle is provided in our post here. There are roughly two archetypical examples of diffusion tensors. On the left you see the example where the tensor has roughly equal eigenvalues for each main vector, thus showing an isotropic diffusion profile. On the right an example of diffusion primarily in one direction, thus demonstrating an anisotropic diffusion profile. When you plot the value of each a diffusivity measure in every voxel you can get scalar maps of the quantification of the local tensors. In the image below you see representative examples of each measure. When you look at the MD map it becomes apparent that the mean diffusivity measure is specifically sensitive to cerebral spinal fluid (CSF), which has high values of average diffusion. In voxels with much CSF mean diffusivity is high, and values are thus bright. While AD is only sensitive to diffusion in the longest eigenvalue. Here you see that highly organized structures like white matter pathways are brights. In addition large open cavities like ventricles have general high levels of diffusion which translates to high lambda 1 values. 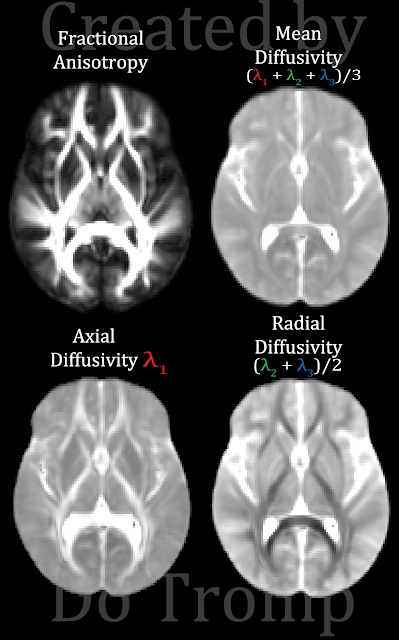 Then RD represents the two shortest eigenvalues and shows dark values in highly organized and dense structures like white matter pathways, intermediate values in gray matter, and high values in regions with CSF. Finally, FA plots the relative length of lambda 1, compared to lambda 2 and lambda 3. 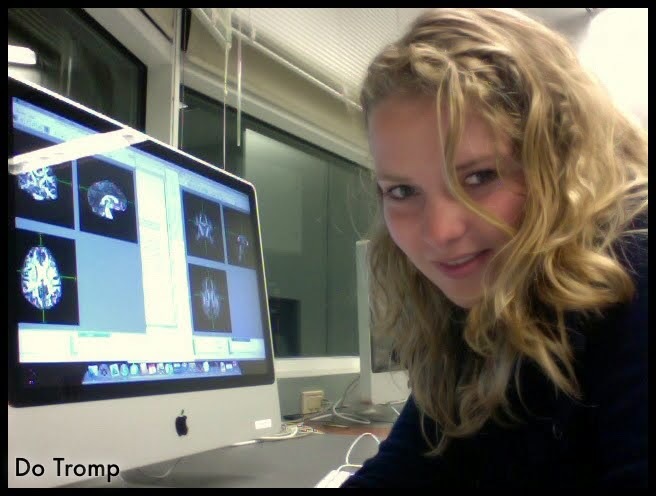 This leads to selective brightness in white matter, but not gray matter or CSF.